March ... Let the melting begin. The weekend of the 28th are Maple Sugar Days events. Tours of local Maple producers are on tap for all to see. One of the best is Patterson Maple Products. 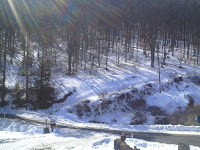 They produce the most maple syrup in the State of Pennsylvania tapping more than 100,000 trees each year. brought back to be processed. 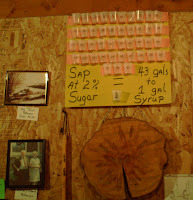 It takes 43 gallons of sap to make one gallon of syrup. The cost of a gallon of syrup is currently $38 up from last year due to a shortage of syrup the last couple years. The sap is running well this year so they hope to make up some of the shortages if things go well. They tap from mid-Jan to early April depending on the weather. It must be above freezing during the day and below freezing at night to make the sap flow. Once the buds start opening on the trees the sap productions slows to a halt. 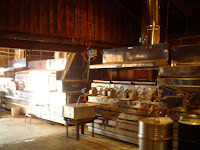 The second picture shows their evaporator which operates on fuel oil to heat the sap into syrup. It is definitely a sweet trip for anyone and the Pattersons are very eager to share all the history, knowledge and passion they have for maple syrup production. They are open all year, but now is the time to come if you want to see the operation running. The Leetonia Road to Cedar Run is open, but caution should remain your guide to crossing a few icy areas. Potholes and road heaves also come fast if you aren't paying attention. Mountain girl, Paula, logging off and tasting maple syrup on my pancakes. 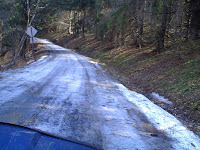 There are only 3 icy spots on the road between Mick's place and Cedar Run. They are shown to the left with the first picture being the farthest away in that low valley with the high water fall and big rocks. The second picture is the last narrows before Leetonia and the last picture is looking from the bottom of Mick's driveway towards Leetonia. The rest of the road is down to the dirt, full of spring potholes. Some of the road is even dry enough to form dust. It would be nice if the road wouldn't go so fast from ice to dust. 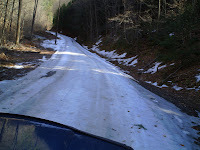 Anyone should be able to come up the road from Cedar Run as long as they slow down for any ice that might be left. I am sure most of it shown will be gone by the weekend. There is a renewed sense of freedom I feel when we can visit all our friends without fear of the road or going 50 miles around to travel 8 miles. As you can tell I am back from Los Angelos. My brother and son tried to convince me to move out there, but my heart is here in the mountains of Leetonia. I took a walk with the dogs the next day after my return and couldn't believe the difference in the amount of snow and ice since before I left. The sun feels more inviting here. The birds are flying back from their winter migrations and everyday a new one can be heard outside singing a song of happiness for the warmer and longer days. My work will pick up as fast as the snow melts and that is good. Mountain girl, Paula, logging off and happy to be back in Leetonia. Last night we had very strong winds which finished off our Tee Pee that a bear decided to redecorate a few years ago. Leo is inspecting the damage hoping a critter runs out from underneath it. There are small branches on the road but the trees held up for the most part. The picture of the waterfall is by our bear bridge. As you can see there is still a good water flow from the rain we got a few days ago. 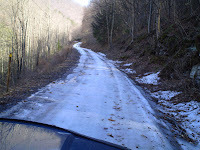 Yesterday I drove the Subaru with studded snow tires down Leetonia Road towards Rt. 414. I didn't have any problems but there is still ice on a good portion of the road. It is melted where the sun hits. If you come up this weekend make sure you drive in the center of the road where it is packed down because the snow on the sides of the road is soft and deep in spots. Conditions change daily so come prepared and use caution. Paula is in California at her business conference so this is Lee posting for her. 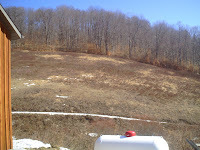 I took some pictures after a thunderstorm behind Valley Hi in Leetonia and the icy road. The sound is deafening. Pine Creek was above 6 feet at Cedar Run. Rain is still in the forecast but the temperatures have not been high enough to melt the ice on the part of the road that isn't plowed. We have not been past Leetonia on Leetonia Road since January. I can only tell you that the road from the Ruins through at least the narrows south of Leetonia are packed ice. I have studded snow tires and I was sliding so right now you need chains. It might be better by Friday but I suggest coming prepared just in case things don't improve. Snow has melted off where the sun shines but under the pine trees and shady areas we still have lots of snow. When I took Paula to the airport last Saturday we saw a bald eagle perched on a tree on Leetonia road a couple miles south of Parker Hollow. We were pleasantly surprised to see a eagle so far from Pine Creek. She took a picture but it flew away and the eagle looks like a speck in the picture she managed to take. Spring is bound to be here soon with all the rain we have been having. We are ready for it. Even the dogs seem happier when the sun is shining. I'm not going to hold my breath though since we usually get a good snow storm around St. Patrick's day. You have to plan ahead if you want green beer. So whether your Irish or not have a good Irish day. Leetonia Lee logging off. March is the month of extremes. The month of the meltdown. The South facing slopes of the mountain melt off quickly in the warm sun, while the north facing slopes easily hang onto their hard packed and icy snow. Every year at this time people come up and get stuck on the roads. The reason for this is almost everywhere else the snow is gone and part of the roads up here invite you to take the risk. The mud covered parts of the road led you to believe you are safe then when it is too late to turn around you will hit several miles of icy snow packed roads, which send many a traveler into the ditch. 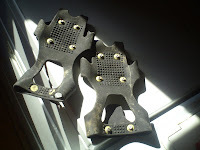 Walking requires cleats such as the rubber slip over ones in the picture below, without them constant slipping and falling is inevitable. The dogs seem to do fairly well with the soft part of their pads acting as slid resistors and having four legs helps when one of them slips. Thor the three-legged dog slips a bit more, but not as much as I expected and he would never miss out on a walk. Even though the temperatures were in the teens as I took my walk today, the sun felt warm and there was a hope of change in the air. The days are stretching out a bit more and the sun feels warmer daily. 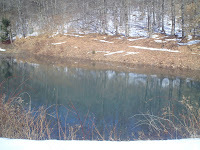 The meltdown from the mountains filled the pond and it gurgled a pleasant sound overflowing into the stream. These are the rewards of living in the woods; the walks, sounds, and constant changing of the seasons. The countdown to April is on. When April comes the woods will surely be past the worst winter has to offer and we will again have the freedom to go anywhere on the roads without worry of deep snow. Mountain girl, Paula, logging out and Marching forth.